I just wanted to share this… As a former member of the military who has been deployed I think I connect to this more than someone else might. If I had been a knitter while in the service (Go Army) I would have loved getting this sort of support. 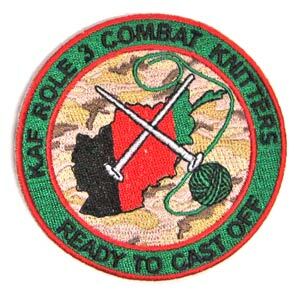 Combat Knitter Patch in Support of Deployed US Soldiers in Afghanastan. Where can I get this patch? The link provided does not work. I’m sorry that the link no longer works. I would suggest trying to contact someone at http://yarnsellar.com/ They may be able to point you in the right direction.